Back and forth. My hand glides against the smooth wood. My fingertips trace the grain of the beautifully sanded surface. Back and forth. I am lost in the softness of the wood. “We’re just making furniture. Not saving lives”, Kasper says with a laugh. Sitting straighter in my chair I look up. Realizing I had lost focus while tracing the smooth surface of the large wooden table we are sitting at. Hoping he didn’t notice my mind drifting, I look at my phone on the table. The screen shows it’s still busy recording every word of my interview. One hour and thirty four minutes the screen reads as it continues to record. A smile spreads across my face as I laugh to myself, remembering how in my email asking to interview him about Danish chair design I said it would only take thirty minutes, maybe an hour. How in the world did I end up sitting here across from Kasper, a third generation craftsman PP Møbler, the workshop that brings to life the designs of Hans J. Wegner, one of the most famous Danish furniture designers. With a strong handshake, Kasper Holst Pedersen, introduces himself and apologizes for running late. His voice is as warm and comfortable as the blue knit sweater he wears. Leading me through the office above the workshop we enter into a small room. The only private office in the building. Light pours into the room through skylights and a long horizontal window. The office is simple with white walls and wooden floor. A large bookcase is full on the right wall, it reaches nearly the full height of the room. As we enter, Kasper’s tall frame bends down to quickly pick up the mail on the floor. Scattered about, it had been slipped in under the door. Gesturing to the large wooden table before us, he encourages me to set my things down and take a seat. All the chairs in the room are mismatched, but each are a design produced by the workshop. Most created by famous Danish designers. I hesitate before placing my coat down. Something seems wrong about placing my dirty coats on these world famous designs. But that thought passes and I happily settle into the chair. It’s a design I recognize, the Wishbone Chair by Hans J. Wegner. The top rail of the back and the arm are made out of a single piece of wood. The light colored wood is sanded until it is soft to the touch. The iconic design is known for the “Y” shaped back that provides comfortable support while also providing stability to the steam-bent top. The woven seat provides a comfortable seat for the user that is also visually pleasing from across the room. These simple details that meet both the functional demands while creating a distinctly clean look is why I love modern Danish design. Wishbone Chair by Hans J. Wegner. Image sourced from here. Sitting up straighter, the woven seat shifts with me. Starting the interview, I begin by asking him to tell me about the history of the workshop. Adjusting his position, he settles into the wooden chair. With a sigh and a smile he begins. Established in 1953 by Kasper’s grandfather and great uncle, PP Møbler is a family owned Danish joinery workshop that has a strong tradition for crafting design furniture of high quality. Due to their unusual relationship with the designer, they are one of the few workshops able to produce the designs of Hans J. Wegner. Described as ‘timeless’, ‘everlasting’ and even ‘perfect to the fullest extent’, Hans J. Wegner is among some of the greatest of furniture designers. With over 1000 models, he was also one of the most productive. As Kasper puts it, PP Møbler’s relationship with Wegner started indirectly with the Papa Bear Chair. 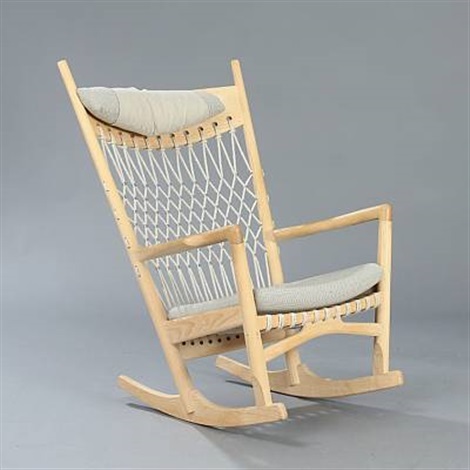 “Throughout the 1960’s Wegner was a popular designer. He worked with six different companies to produce his designs, most of which only produced Wegner designs”, leaning back in his chair, Kasper hands begin to talk with him. “In 1969 the demand for Wegner designs started to decline. This was in response with the cultural revolution and mass production that began in the late 1960’s &1970’s. The companies began to fight over who could work with Wegner. Not wanting to be apart of it Wagner decided to start working with PP Møbler. The company stuck out to him for my grandfathers stubbornness”, a proud smile spreads across his face as he continues on. Papa Bear Chair. Image Sourced from here. “The company stuck out to Wegner for their stubbornness to produce well crafted designs. Years before Wenger had visited the PP Møbler workshop, which was making the frames for his famous Papa Bear Chair. At this time PP Møbler was a very small company that primarily did subcontracting work. They were hired by another company who were the official producers of the Papa Bear Chair to create the wooden frames. During his tour of the workshop, Wegner pointed out to Kasper’s grandfather that they needn’t put so much effort into the pieces they were assembling as they were going to be covered by upholstery. Essentially stating all their hard work was wasted because it would never be seen. In response to this the grandfather scoffed, saying that no they must produce something of which the craftsman can be proud of, otherwise what is the point. This retort came as a surprise to Wegner, as most people would see and agree with his assessment. But not my grandfather. He was stubborn and stuck by the importance of his craft.” The sense of pride in Kasper’s voice is clear. Capturing the reason why his grandfather would boldly contradict Wegner, Kasper states, “It’s the details of a well designed chair that make it desirable. The details are what make it worth passing it down through generations of family. The details are what keep it interesting.” As he says this, Kasper’s hands trace the soft ends of his chairs armrests. Rocking Chair. Image sourced from here. Leaning his elbow on the big wooden table between us, Kasper hands gesture wildly. We are both sitting in beautifully formed, handcrafted wooden chairs. Designed by famous Danish designers. The small office is filled with these chairs. Each one their own design. Looking around, I think back to the famous chair exhibit at the Danish Design Museum. When I pushed back the thick plastic drapes, a sharp smell of chemicals filled the air. My eyes adjusted to the dimly lit room before me. A projection played on the far wall. On either side stood wooden display cases, with white interiors. Each were likely a square meter in size. On display were rows and rows of Danish chairs. Hans J. Wegner, Arne Jacobsen, Finn Juhl. Strange but faintly familiar sounding names were listed below each chair. My steps echoed off the marble floor as I ventured further into the space. Stacked three high, the display cases were all tilted. Which allowed me to view all three chairs at the same angle. As I passed each display, a bright light flickers on. Dramatically highlighting each chair before me. Giving each chair the same light. The same level of importance. A subtle but well thought out design element of the exhibit. Subtle, thought out designs are the reason these chairs are on display. The majority of famous Danish chair designs came from the mid century period, which is generally understood to be furniture created during the period after World War II through the end of the 1960s. Scandinavian design is characterized by its design philosophy of simplicity, functionality, and clean lines. Minimalism is also an important concept for the mid century designs as it contributes to a simple home environment that is intended to improve one’s daily life. This idea has intrigued me. The thought that a well designed chair, item, or space could improve one’s life makes me want to learn more about design and is effect on the user. “Isn’t it true that all chair designs can be traced back to two chairs?” I timidly ask Kasper. A warm smile spreads across his face, glancing around the room before answering. “Ehh you could say that yes”, as he thinks he pulls at the loose neck of his knit sweater. “Each design needs to solve a problem. The problem could be as simple as, umm here.” He turns in his chair showing me the clean wooden back. “The problem could be as simple as wanting to make a chair as successful and comfortable as this one but instead of a hardback you want to allow it to have some give. Making it more comfortable for someone to sit in. That is how designs can build off one another.” Looking around the room, I take in the random chairs with a fresh perspective. Instead of competing with each other each chair seems to complement the others design. Their similarities and differences are allowed to shine when placed side by side. Reaching for a wooden object on the table, Kasper continues to explain, “another reason chairs can be derived from two is that sometimes there is a correct way to solve the problem.” The object he holds is a beautifully carved wooden seat. Made out of a single piece of wood the form is similar to that of a bicycle seat. “Some critics of this design may scoff and say it looks like a bicycle seat. But is that a bad thing? The reason the seat is formed this way is because look here” pointing to the gentle curve from the flat seat to the side Kasper continues, “ the curve here is very important. The seat need to curve like this in order to allow someone to sit comfortably for a long time. If instead, it was a sharp corner the blood circulation to the users leg would be cut off, thus making it uncomfortable to sit. This is something many designers forget to think about. I think it’s what makes the difference between a good design and a great one. This is what Wegner excelled at, knowing the human body”. Sitting back in my chair I feel the hard wooden back press against the small of my back. Providing support in just the right place. Again and again the importance of ergonomics and form has come up in our conversation. Kasper captures this importance due to the shape of the spine, “Chairs are the hardest to design. There is a balance between aesthetic, comfort, and economy. The chair needs to align with the back with a double curve. The vertical curve fits the shape of the users spine while the horizontal curve allows for movement and comfort for the user.” In the corner of the office I notice a model of a human backbone waiting to be referenced. There is something beautifully simple about chair designs. They either work or they don’t. It’s black and white. A successful chair design is both aesthetically pleasing and comfortable to sit in. But achieving this balance is far from simple. An architect once said that it is easier to design a house than a chair. I believe that there is a lot of truth in that. There are a lot of factors to take into account. You want a lightness to the chair. You need to think very carefully about the ergonomics. This complexity and demand for balance is what I, as a designer, have become fascinated while abroad. As an interior designer, I strive for creating a comfortable space that meets the users needs. Furniture design strives for the same goal at a smaller scale. Craftsmanship and materiality play a large role in Danish chair design. Materials are chosen for their beauty and durability. Wood, specifically light colors, are often selected for Scandinavian furniture. A strong preference for teak, oak, and pine can be seen. Wooden chairs are rarely stained. Instead, designers prefer to treat their pieces with special oils that let the beauty of the natural color and grains come through. Plastic and metal were also often used as these materials allowed for flexibility when it came to shape and color. Wool, cotton, and leather are typical choices for upholstery. Sustainability and eco friendliness are key factors in the selection of materials for Scandinavian design. As a testament to the desirability of original design, as I write this I am sitting in an original Wegner chair. The dad in the Danish family I am staying with got notified about it on a Monday morning and drove to Svendborg on the island of Fyn to pick it up. He was lucky to get it as four others were also fighting for the chair. The original design is roughly 65 years old. Sitting in the sunny, white walled living room the chair blends in stylishly with the rest of the room. Living proof of Kasper’s belief that “ Wagner’s work will be relevant for many years. His designs are strong and durable, beautiful and flexible”. The carefully carved wood and worn in leather are a testament to the fact that Danish furniture is designed to last many lifetimes. The fact that these pieces are initially designed to last and be passed down generations is something I think all designers can learn from. We need to design chairs, spaces, buildings, even cities that will last for the generations to come. The choices designers make need to be made with the thought of not only of how it will affect users today or tomorrow, but how it will affect the users in twenty or even fifty years. Designers need to demand from themselves to create spaces that can outlast their lifetime. Spaces that can grow and adapt as the user’s needs change. Shifting my position, the middle of my back is perfectly supported by the chairs leather back. Just as it was designed to do 65 years ago. The seat is angled so my body settles into a relaxed posture. Allowing me to comfortably watch tv from across the room. My arms rest comfortably on the chair armrests so perfectly that they seem to have been measured just for me. Once again my hands can’t help but glide back and forth against the smooth wood. I’m in love with the rocking chair. Before this post, I never thought I would it but now I really do!